This dress is in wonderful condition, I only wore on my wedding day for only about 2 hours, and took it off. It is dry cleaned and preserved and already in a box, clean and ready to be shipped out. The belt also can some with it. It is optional and only if you would like it, however, the belt was the staple of the dress for me. I want to be able to give this to someone else to be able to treasure for their special day, as I am not looking to keep it any longer. The price can be negotiated. However, because of the quality, the price is very reasonable. It is ivory with a curve neckline and a line shape, good for those who are curvy in the hip and but area like myself. I did get it altered for my height as I am a little bit shorter at 5'5. 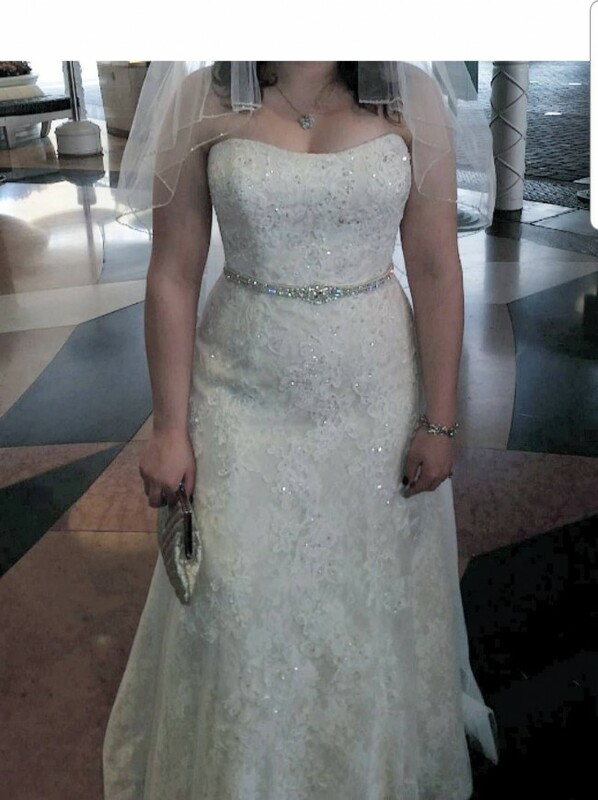 So, it was tailored to my height (the dress still ended up long) and my weight as before I got married, I did fluctuate in weight and lost some. However, because the dress is a corset back, it gave room for gaining or loosing weight. This is why the dress is very valuable as it gives room for weight fluctuation if needed.